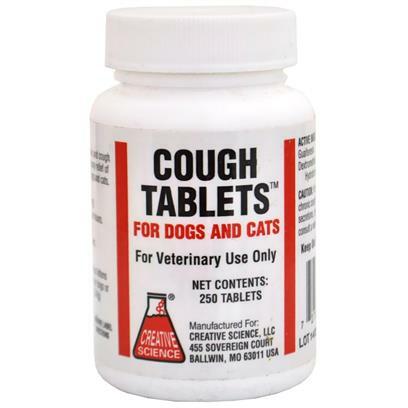 Cough Tablets By Life Science Indications: An expectorant, antitussive and cough suppressant for the temporary relief of cough symptoms in dogs and cats. Dosage and Administration: Small Dogs and Cats: One-half (1/2) tablet; repeat in four (4) hours. Large Dogs: One (1) tablet every four (4) hours. Contains guaifenesin and dextrometherphan. Caution(s): If the animal's cough is persistent or a chronic cough is accompanied by excessive secretions, prolonged depression or fever, consult a veterinarian.